This part contains a PETase fusion protein expressed on an inducible T7 promoter to be secreted extracellularly with an HlyA tag and an alpha-hemolysin secretion system on an inducible pBAD promoter(BBa_K1166002). The PETase fusion protein contains codon-optimized versions of isPETase (Joo et al. 2018), and a cellulose binding domain sequence from Imperial 2014. 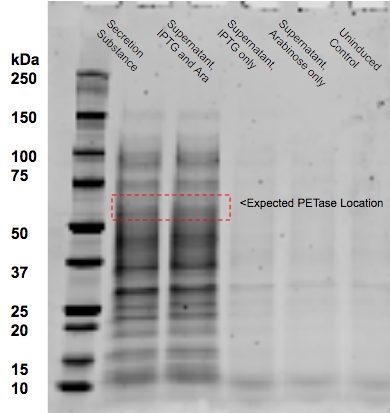 Expression of the PETase-CBD fusion protein can be induced with of IPTG , which expresses a PETase enzyme with a cellulose binding domain that can be bound to bacterial cellulose and degrade polyethylene terephthalate. The HlyBD secretion system is inducible by arabinose and was intended to secrete the fusion protein with an HlyA secretion tag, however secretion has not been confirmed. The part must be transformed into a strain with T7 polymerase. The PETase domain of the expressed protein was found to be functional, as was the cellulose binding domain. However, the secretion system did not successfully send functional PETase into the supernatant. Other iGEM teams who have attempted PETase secretion hypothesize that this may be due to the solubility of PETase or lack thereof. 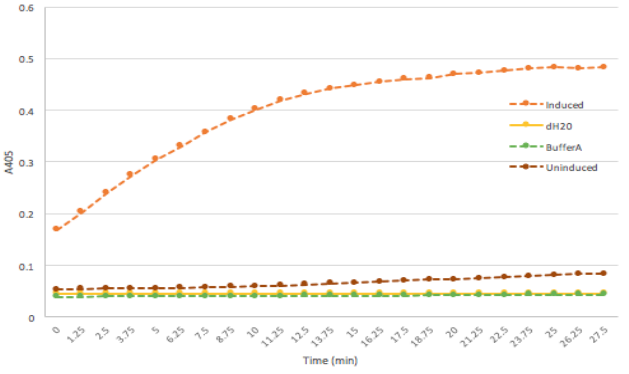 The SDS PAGE gel below shows expression of the PETase fusion protein in whole cell fraction 0hrs and 5 hrs after induction of BL21 DE3 E. coli, where the fusion protein is expected to be around 60kDA. The unexpected band around 40kDa may have been a result of a cleavage of the NC linker. 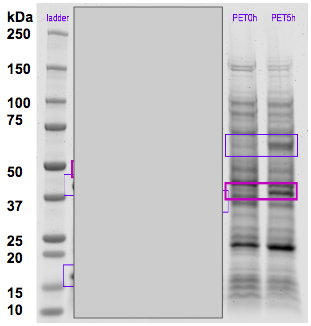 Below are results from PETase expression using the dual promoter. The tube on the far left, in which protein production was induced by IPTG and the HlyA secretion system was induced by arabinose showed a distinct, floating white precipitate in its supernatant. We harvested this supernatant and tested it with the SEM. A pNPB assay confirms PETase esterase activity of induced cell lysate containing the PETase-CBD-HlyA fusion protein relative to an uninduced control. pNPB is a common assay done by many iGEM teams in the past to assess esterase activity of enzyme since the cleaved product has a known absorbance at 405 nm. A kinetic run was taken for 15 minutes and shown below. Scanning electron images of the protein degrading high crystalline PET from a water bottle after 6 weeks. On the left is a negative control using water, on the right is plastic exposed to induced cell lysate. Visible cracks along the surface of the plastic water bottle fragment indicate the surface is clearly degraded by active PETase in cell lysate. A pNPB assay was used to test the cellulose binding domain. Lysate containing the fusion protein was applied to increasing amounts of bacterial cellulose and allowed proteins with cellulose affinity to bind. After 72 hours, the liquid fraction was collected and assessed with pNPB to determine the concentration by difference of PETase that was bound to cellulose. When cellulose is present, esterase activity in solution is markedly reduced. We hypothesize that the CBD domain of the protein is binding the cellulose, which isolates it from solution in which the substrate is contained. 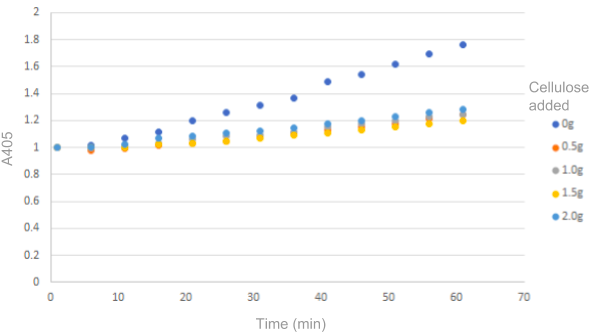 We expected to see decreasing amounts of unbound PETase in solution as we increased the amount of cellulose, but given the little difference between the different amounts of cellulose added, we hypothesized that the cellulose had not been saturated with PETase, so no difference is observed in increasing the concentration of cellulose. Ultimately, this removes PETase from solution and reduces contact of PETase with dissolved PNPB, so lower esterase activity is seen. If cellulose is put in direct contact with a solid PET surface, the binding of the CBD domain may increase PETase concentration on the PET surface and increase esterase activity on the solid PET. The SDS PAGE gel of our separate and dual inductions of E. Coli BL21 cells of the fusion protein and the secretion system are presented below. Once cells were induced in culture, the cells were pelleted and the media was sample for secretion. The supernatant was sampled for secreted proteins and found that the induction of +IPTG +arab showed secretion similar to whole cell lysate, but no band present indicating secretion of the fusion PETase. Unknown white and cloudy substance was found in the double induction and was also ran on the SDS gel. SEM images of the protein degrading low crystalline PET from plastic film after two days. 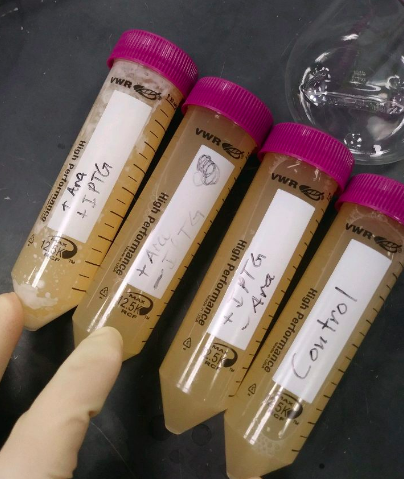 Negative control on the left, PETase culture supernatant center, and PETase culture lysate on the right. If PETase secretion by HlyA is successful, we expect to see degradation from the supernatant due to presence of secreted protein. However, we do not see that here so we conclude that the HlyA secretion system is not suitable for this protein.